Goals in each half from Ray Cahill (penalty) and Alan Smith were vital as Sarsfields scraped over 14-man Moorefield in today's Kildare SFC final in Newbridge. 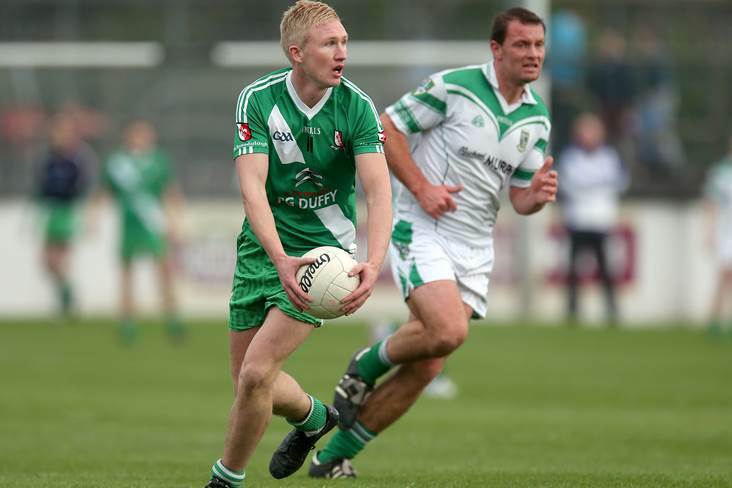 The 51st minute dismissal of Moorefield veteran, and new Kildare selector, Ronan Sweeney was one of the main talking points as The Sash overturned a one point half-time deficit to retain the silverware. Cahill's converted penalty came as a welcome boost to John Crofton's side and they trailed by 1-4 to 0-8 at the halfway stage. Smith's second-half strike was a key ingredient in their winning formula while Sweeney, who had kicked five points (four frees), saw red nine minutes from the end following an off-the-ball altercation. Ronan Fitzgibbon and Dan Nea sent over late points to ensure that the Dermot Bourke Cup remains in the Sarsfields trophy cabinet for another 12 months. Sarsfields - A O'Brien; C Duffy, S Ryan, D McDonnell; B Coffey, G Whyte, C McInerney Aspell (0-1); C McDonnell (0-1), C Kavanagh; R Fitzgibbon (0-1), R Cahill (1-5, 1-0pen, 0-3f), C Hartley; B McCormack, D Nea (0-3, 1f), A Smith (1-0). Subs: C Tiernan (0-2) for B Coffey, J Healy for C Duffy. Moorefield - T Kinsella; L Callaghan, N Galvin, L Healy; R Houlihan, P O'Flynn, A Durney; D Whyte (0-1), K Murnaghan; E O'Connor (0-2), R Sweeney (0-4, 3f), A Tyrrell (0-5, 3f); C Kelly (0-2), J Philips (0-1), J Murray. Subs: N Hurley Lynch for J Philips, I Meehan for C Kelly, C Barrett for A Durney, D Flynn for A Tyrrell.